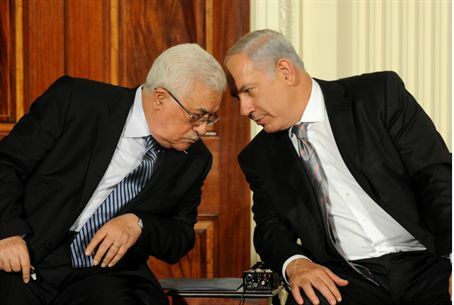 MainAll NewsPolitics & Gov'tPM to Abbas: "You're My Partner"
PM to Abbas: "You're My Partner"
Netanyahu, Clinton, and Abbas are making last-minute preparations for the much-touted direct talks in Washington, set to begin at 5 PM Israel time. Prime Minister Binyamin Netanyahu, U.S. Secretary of State Hilary Clinton, and PA chairman Mahmoud Abbas (Abu Mazen) are making last-minute preparations for the much-touted direct talks, set to begin at 5 PM Israel time (10 AM in Washington). With so many weighty issues in the background, the foreground talks themselves are sometimes hard to make out. Looming behind the scenes are the two Palestinian terrorist attacks over the past two nights that claimed four lives and wounded two others, the fast-approaching end of the Jewish construction freeze in Judea and Samaria, and the threats by Abu Mazen to quit the talks if the freeze is not extended. However, he emphasized, he would not make any concessions in terms of security. “Peace must provide security,” he said, and the “West Bank,” as he called it, must not become one that is dominated by terrorists, as occurred in Lebanon and Gaza. He said he is confident that peace is possible. Netanyahu has told the Americans that the freeze will end on Sept. 26 as planned, explaining that settlement construction is actually a final-status issue and should not be dealt with separately. Danny Dayan, head of the Yesha Council of Jewish Communities in Judea and Samaria, has also traveled to Washington. He told Haaretz he is there in order to speak to the media and make the case against a Palestinian state, and to monitor the situation and initiate quick decisions if necessary.